There is a new business in town! Dothan Medical Associates introduced their new business, The Gout Clinic, to the Wiregrass area. Gout is a serious disease that causes pain, swelling, and can potentially have dangerous consequences if left untreated. Thankfully, Dothan now has a clinic set up for treatment and care of those with this ailment. To brand their new practice, The Gout Clinic asked for advertising assistance from the Famous Makers here at Durden Outdoor Displays, Inc. Our creative team worked from the ground up, building their overall look, including a new logo for the business. 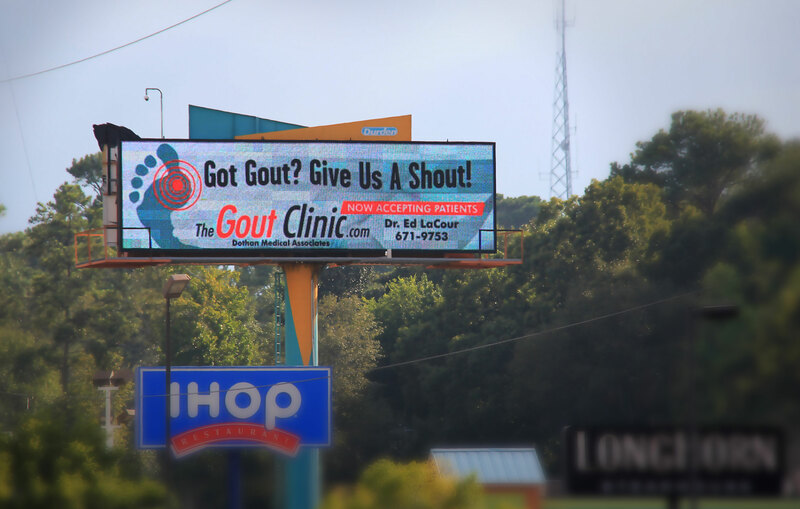 Right out of the gate, The Gout Clinic was receiving calls and setting up appointments, drawn in by their outdoor campaign on the Durden Digital Network. They utilize (3) Digital Billboards that rotate every (4) weeks through out the Dothan market. This allows The Gout Clinic to saturate the market and target different areas of the city each month. When asked how their campaign was going for them they said it was “really bringing in the phone calls!” If you are in need of treatment for Gout, set up an appointment at TheGoutClinic.com. If you would like to promote your specials through out the Durden Digital Network and reach over a million cars daily, please contact one of our FAMOUS Makers today at (334) 792-5056 or sales@durdenoutdoor.com. Hey Enterprise folks! Does your neck and back pain stop you from doing simple day to day tasks? 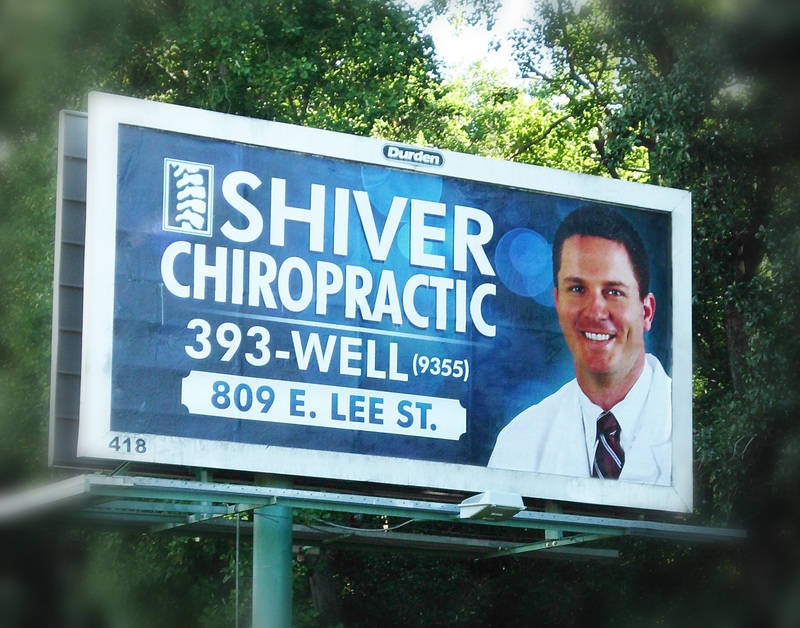 Our friends at Shiver Chiropractic Clinic, on Lee Street, can help put your pain at ease. Shiver Chiropractic Clinic specializes and can aid in joint, back, neck, head and many more types of pain. Shiver Chiropractic Clinic partnered with the #FAMOUSMakers at Durden Outdoor Displays, Inc. as they wanted to brand their practice. We launched an outdoor advertising campaign utilizing our Rotary Poster Program in the Enterprise market. Rotary Posters are billboards that rotate an advertiser’s message on different locations in one or more markets every four weeks. This allows the customer to saturate the market and also change their message up monthly if they would like to do so. Durden Outdoor’s creative department came up with a nice, clean look that includes a welcoming photo of Dr. Shiver. After a few months of circulation through out the Enterprise market, Dr. Shiver isn’t able to go anywhere without being recognized. More importantly, he has seen an increase in business. In 2016, Durden Outdoor Displays, Inc. built its first Digital Display in Troy, AL located at the intersection of Hwy 231 and Hwy 167. This intersection boasts the highest traffic count in the City of Troy. To keep up with the growing demand to target the highest retail area, Durden is excited to announce the launch of our second Digital Display in the Troy Market. The new Digital Billboard is located on Hwy 231 just north of George Wallace Drive targeting northbound traffic. 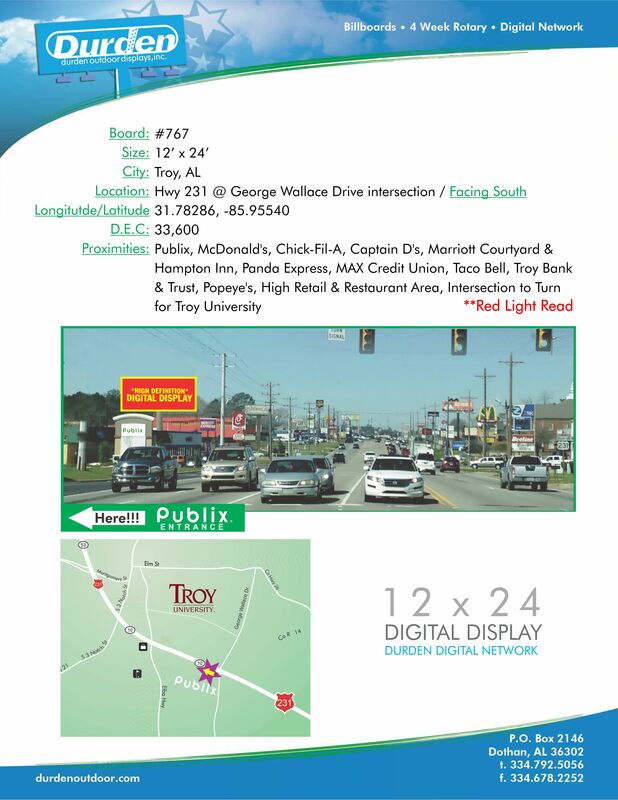 This Digital Display also targets both entrances to the new Publix Shopping Center as well as traffic headed to Troy University and downtown Troy. Durden is excited about the growth of Troy and the economic impact it is making on southeast Alabama. The addition of the second Digital Display will give clients the opportunity to rotate between the two Digitals every (4) weeks, giving them circulation through out the market. This is the 29th Digital Billboard in the Durden Digital Network which also covers Dothan, Enterprise, Ozark and Eufaula, AL. If you would like to reach the highest traffic area in Troy, give one of our FAMOUS Maker’s a call today at (334) 678-2215 or you may email us at sales@durdenoutdoor.com.